On Feb 15, 1999 the Zetas described the vibration that rock under pressure exhibits. As the passage nears, during that day, the Earth will begin to groan and moan, resisting yet inclined to shift. But until the actual shift, the tension is sustained, and the Earth groans in her agony. The moaning of the Earth is akin to material snapping, screeching rock strata pulling across other strata, and vibrations of rock strata under tension. 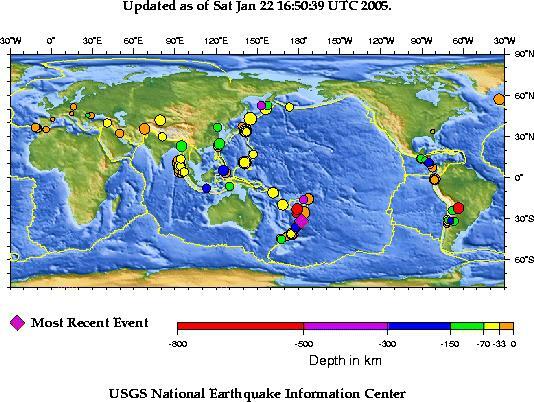 Many sensitive people report becoming ill prior to earthquakes due to similar vibrations, not particularly heard, but felt by the body in any case. In similar manner, many more humans will feel ill during the week of rotation stoppage, and not just due to the stress of the moment, but due to vibrations in the underlying rock strata. On May 1, 2004 the Zetas also predicted the emergence of an Earth torque caused by a tug back upon the magnetic S Pole while the Earth continues to rotate. This torque emerged in earthquake charts such as IRIS charts after the Dec 26, 2004 massive tsunami quake in Sumatra, with the West Coast of the US being virtually free of quakes the rest of the Ring of Fire was experiencing. The overall effect of this drift, which will increase in speed and force as the whiplash proceeds, will be a torque. Hold the globe with the left hand on the N Pole, the right hand on the S Pole, and turn in opposite directions first this way, then back. The N Pole going in the direction of rotation with the S Pole held back, the torque forces the N American Plate down and into the Caribbean, East moving in the direction of SE. The S Pole pulled back by a grab on the Atlantic Rift in the southern hemisphere with the N Pole held rigid has the Indio-Australian Plate plunging under the Himalayas and Africa likewise plunging into the void, again East turning to SE. Put your hand on the N. Pole of the globe, twisting to the right as though turning the cap off a jar. Put your other hand on the S. Pole of the globe, twisting to the left as you open the jar, in this case the Earth, her plates coming apart. You not only pop the Indio/Australian plate lose and plunge the Pacific and Philippine plates under Asia, you relieve stress along the entire N. American continent! On Feb 23, 2008 geologists released information on a new Earth hum phenomena, which they ascribed to a 'twisted crust' hum. Listen closely, and you'll hear the Earth humming - in not just one note, but two. The source of this second signal is a mystery. For around a decade we've known about Earth's quiet "vertical" hum, probably caused by the steady thumping of deep waves on the ocean floor. Now a team in Germany has discovered a second "horizontal" note, too, and nobody knows what's causing this new signal. They found evidence of a "horizontal" signal at all four stations. The signal migrates by around 1 micrometre one way or the other every three minutes or so, and its horizontal orientation distinguishes it from Earth's "vertical" oscillation. (Geophysical Research Letters) Though certain events seem to amplify this constant signal - such as earthquakes, volcanoes and large storms - the source is a mystery. "Something entirely new to us is causing this hum," says Spahr Webb of the Lamont-Doherty Earth Observatory in New York, who studied the original hum. "Something entirely new to us is causing this hum. Its frequency suggests something is 'twisting' the surface of the crust." The frequency of the new signal suggests something is "twisting" the surface of the crust in some way, says Widmer-Schnidrig. When released, the crust swings back and forth because of its elasticity.